As part of our client’s ongoing branch improvement programme we are asked to provide energy efficient solutions to replace VRV systems operating on R22. In many cases we elect to install a complete new VRV installation - however using the Daikin VRV-Q system it is sometimes possible to use existing pipework connected to new equipment. As part of our design process we were able to select equipment from the Daikin VRV-III Heat Recovery range that allows us to offer running cost savings estimated to be upto 40%, whilst the installations also qualify for cost savings under the Government’s Enhanced Capital Allowances (ECA) scheme. Heat recovery ventilation is also included. Where necessary our installation teams operate out of hours, allowing ‘business as usual’. For larger projects, such as a full branch fit out, branch closures allow for normal hours working, following strict programmes. 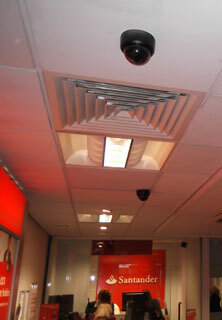 All of our installation teams are vetted and security cleared to work in security sensitive locations.